Fun With Puzzles presents the Fun Riddles in English for Kids. These are Fun Riddles which one can ask from his/her friends and surprise them with the funny answer of these riddles. 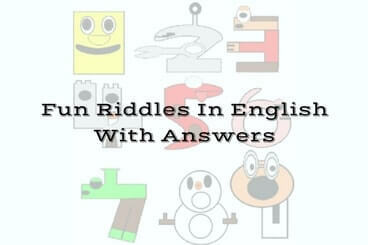 Answers of these Fun Riddles in English are given at the end. Do try to solve these riddles with looking at the answers. These Fun Riddles is extension of the earlier published riddles with post titled "Quick Super Funny Riddles for kids with Answers". 21. Tom decided to give his bike 3 coats of paint. Which coat would go on the first? 22. If you have 5 fished in the a fish tank and 2 drown how many fishes do you left with? 23. What has only two words but thousands of letters? 24. What starts with letter E and has only one letter. 25. What never asks questions but is always answered. What am I? 26. What is the longest word in the English language? 27. Which letter of the alphabet has the most water? 28. Which word in the dictionary is spelled incorrectly? 29. What grows when it eats, but dies when it drinks? 30. What has no beginning, end, or middle? 31. What has many keys but can't open any doors? 32. When you look at my face, you can't find 13 any place.What am I? 33. What you can catch but not throw? 34. What has one eye, but cannot see? 35. What can you hold without ever touching it? 36. If you had only one match and entered a COLD and DARK room, where there was an old heater, an oil lamp, and a candle, which would you light first? 37. Some months has 30 days, some months have 31 days. How many months as 28 days? 38. What has hands, but cannot clap. What am I? 39. What can you catch but not throw? 40. What demands an answer, but asks no questions. 41. Which alphabet is a part of our body?